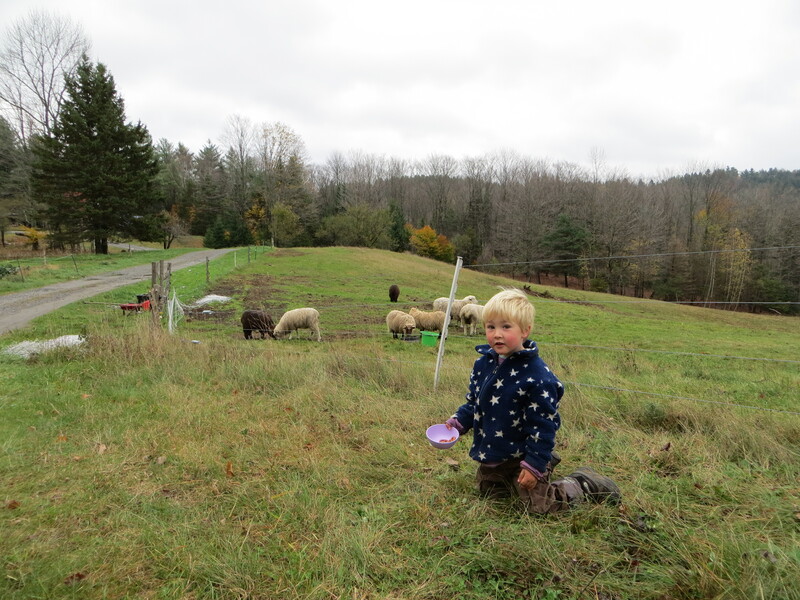 It’s still February but things are changing – our friends with greenhouses are starting seeds, a couple days in the high 30s hastened our maple trees tapping, and we are looking around the corner to piglets and then lambs being born. February and March are often sited as the cruelest months. They get your hopes up for warmth, snowmelt and flowers and then dump two feet of snow and a wind chill of minus 20.
piggy – a technical term referring to the body changes associated with the last stages of pig gestation. The animals seem ready for spring. As the temperatures flirt with 40 degrees they begin to get frisky, smelling the grass not yet growing under the snow. We have been watching our gilts closely for signs that they are beginning to go into labor. 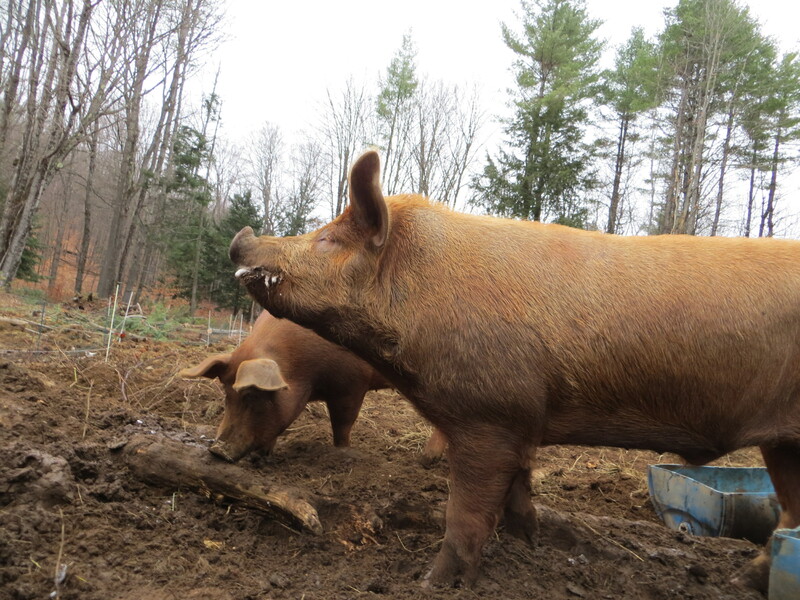 Crescent, Gibbous, and Luna have been looking piggy for a couple weeks and we have just crossed the earliest possible date for their farrowing. It’s our first round of farrowing (previously we have been buying piglets that are 6 weeks old) and we are anxious that it all goes well. Pigs are amazing and prolific animals. They can have 14 piglets and farrow twice a year. While it’s not likely, our three ladies could produce an amazing 96 piglets this year. We are hoping for mid-sized litters of 8-10 healthy piglets or a total of 50-60. We are planning to raise to slaughter 20 piglets from each farrowing and sell the rest to other farmers and homesteaders for them to raise. About a month after farrowing lambing will start – by then we will be deep into mud season. Well we just got 10 inches of snow but the sows farrowed, we have boiled some sap and are expecting lambs next week. These are all signs that spring is around the corner. Lately the season seems to be coming and going – cold then warm, snow then rain and now finally cold and snow. The worst effect is that the variability affects our conditioning. Sunday I went out to do chores and was planning on accomplishing a few outdoor tasks after chores. Shockingly it was 15 degrees with a light wind. The shock was too much and I had to pull out my holiday “get out of work free card” and went inside to brew beer. Up here in Corinth there have been moments of winter punctuated by the weather of March. Most of our fall work is finished – although Gabe is not so secretly hoping for a January freeze to get some more fence posts in. As the cold settles we have been inside working on our business plan and strategizing. One of the things are on mind is how we make our sausage – compared to the legislative process the details of our sausage making is uplifting. Currently we are getting our sausage links made at the Mad River Food Hub by their chef/butcher Jacob. We really like Jacob, his boss Robin, and the facility. 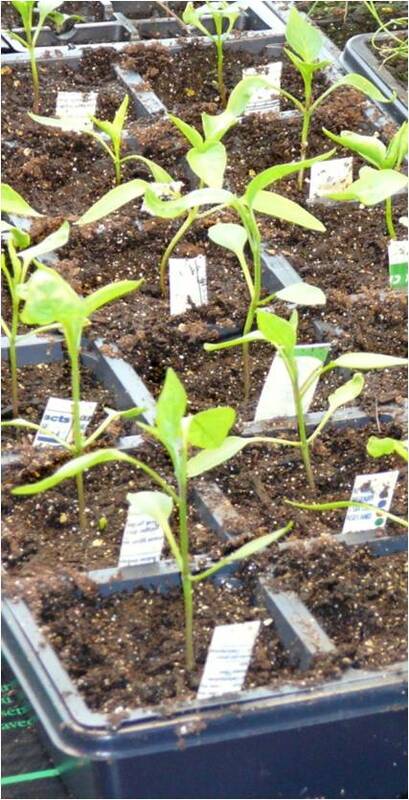 The Food Hub was created to serve the needs of small and growing farmers like ourselves. It is set up to help incubate businesses – give them a place to make their products until they are large enough to own or rent their own facility (if they are ever that big). Robin – who manages the place, owns the building and stewarded the creation set it up as an L3C (vs LLC or 501c3 for the tax buffs) which an innovative model that combines some elements of the non-profit world and the for profit world. Being an L3C and having a community minded mission are a couple of reasons that we are happy to work with them. Honestly though it’s the incubator model that most excites us. In the long run having control over our product, being able to test our own recipes and saving money by doing the work ourselves are additional reasons to work with the food hub. For the last couple of batches of sausage Jacob has been doing all the work. We are planning in January to do it ourselves. This means that we can set aside a bit to try out new varieties of sausage – maybe a maple flavored breakfast with our own maple syrup? Our nephew River would like an apple flavored variety. What kind of sausage would you like us to make? Let us know. 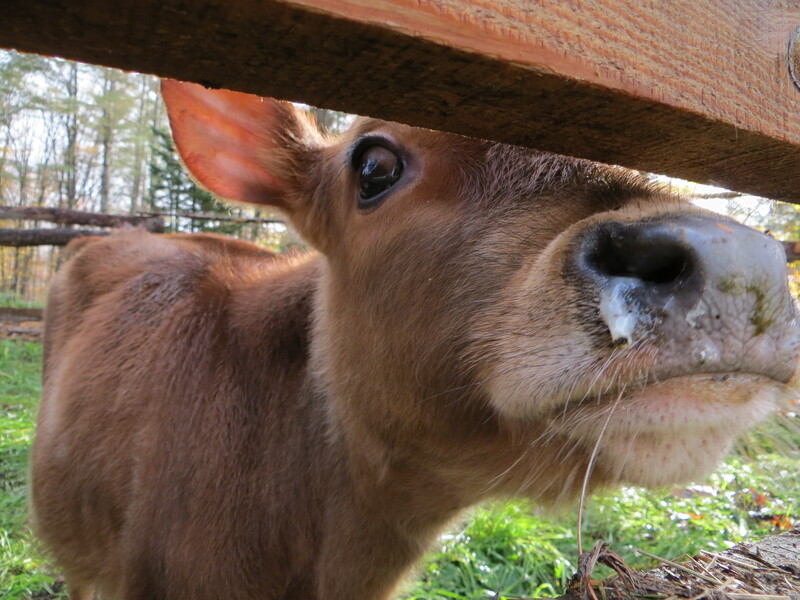 We love cows – all kinds – ornery, placid, opinionated, and gentle. They are an important part of our small farm. Thanks to a couple of gifts from Gabe’s Aunt and Uncle at Fitch Family Farm cows are the first animals we raised together before we were married. But cows grow slow, eat a lot of hay that we buy from our neighbors, command more respect and fencing than the rest of our animals, and are the most nerve-racking to load in a trailer. Cattle genetics are a little more finicky when it comes to a pasture/grass based system, most commercial breeds have been ruined by feedlot agriculture, and the older breeds grow very slowly (2 ½ to 3 years until slaughter). We love our Highlander/ America Milking Devon crosses but they are slow to get to size and unless they we are breeding registered animals (and preserving the breed) I am not sure they make sense. So we are trying a few different things. We have bought an Angus yearling bull that we hope will breed the Highlanders and we are trying some Jersey steers. The Jerseys are a milk breed that is not widely respected for its ability to grow meat. This means the price is right (the steers are free) but they are not likely to outperform our Highlanders in growth rate, specially on grass. I have heard a number of people rave about Jersey meat. We are looking forward to comparing the taste of Jersey, Highlander and Highlander/Angus. Of course we are going to have to wait a few years to do this. 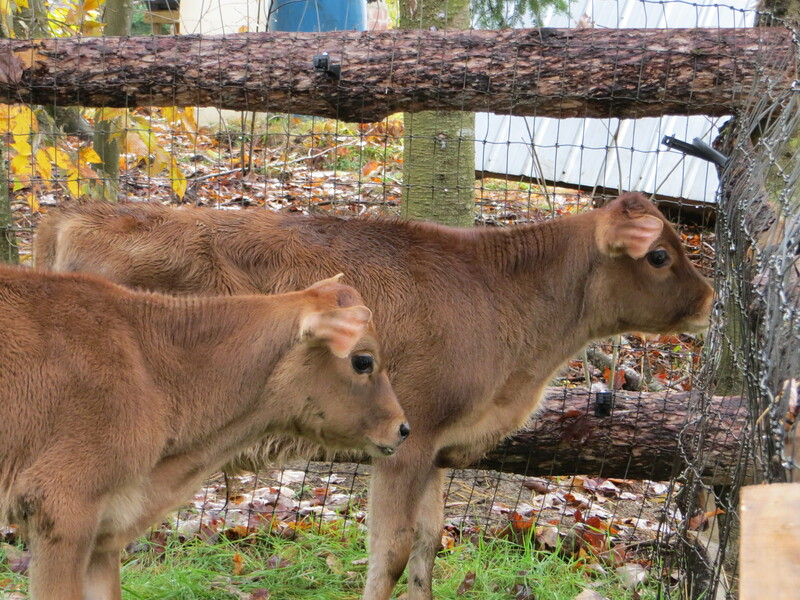 The upside of our Jersey steers is that they are the sweetest, calmest, and most affectionate calves we have ever had. Eben gives them pats every day and they love people. Definitely not in the ornery category.